This lovely blue star crocheted afghan will definitely add elegance to any room in your home. You can use it as a bedspread, a table cover, or a sofa throw. In fact, the uses for this beautiful and stylish crocheted afghan are limitless! Intermediate and advanced crocheters will surely enjoy making this elegant blue star afghan pattern. Once completed, this stunning blue star afghan should have a measurement of around 60 inches by 60 inches. If you are using the metric system, the finished crocheted afghan should be about 152 cm by 152 cm in size. 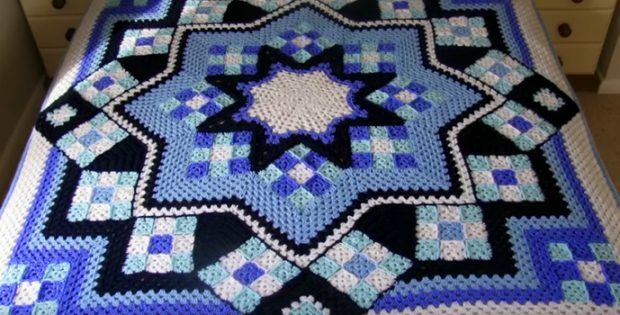 This magnificent and creative blue star crocheted afghan is a design by Kathy Blakely. You can access the pattern for this lovely blue star afghan for FREE. Featured image: Herrschners – thank you!